Outside in all weathers, we London Walks guides know a thing or two about battling the cold weather. I love @londonwalks guides: #rain or #shine they are out there! Just had a fab #LittleVenice walk. Thank you Jan. But the rain is a two-way street, you know. I've blogged it before: it's not so much that WE as London Walks guides go out in all weathers… it's that YOU London Walkers come out and join us in rain and snow, blizzards and gales. The rain, it has to be said, was unusually heavy. Combined with the tail end of Storm Imogen, there was no hiding place. When I got home I squeezed out my Doctor Martens like sponges. My army surplus coat was so soaked that it was like carrying the weight of another person on my back. The stuff in my bag, however, remained bone dry. Thanks to my mate Matthew. I am constantly on the lookout for a good rucksack. I'm often out and about all day, leading walking tours, filming and photographing London for this blog and recording the London Walks Podcast and I need to take my tools with me (I'll reveal the mysteries of what goes in a London Walks guide's bag in a later post). 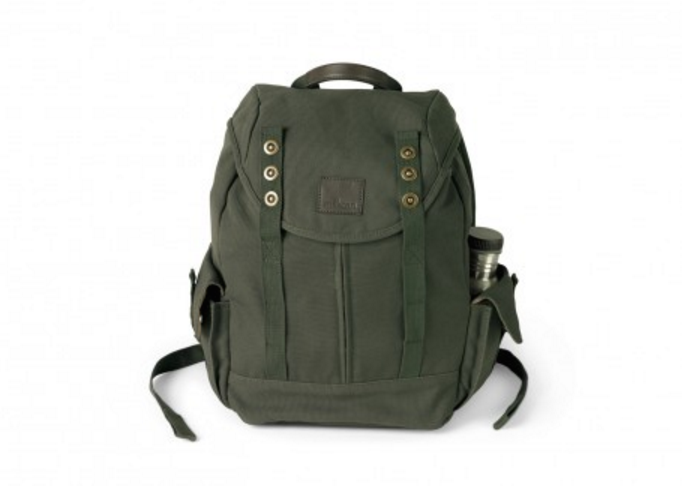 In a good rucksack I want comfort, sturdiness and I want it to look stylish, too. I am very picky. Almost all of the bags I have used over the years have been compromise options: big enough but not waterproof; waterproof but ugly; stylish but impractical. 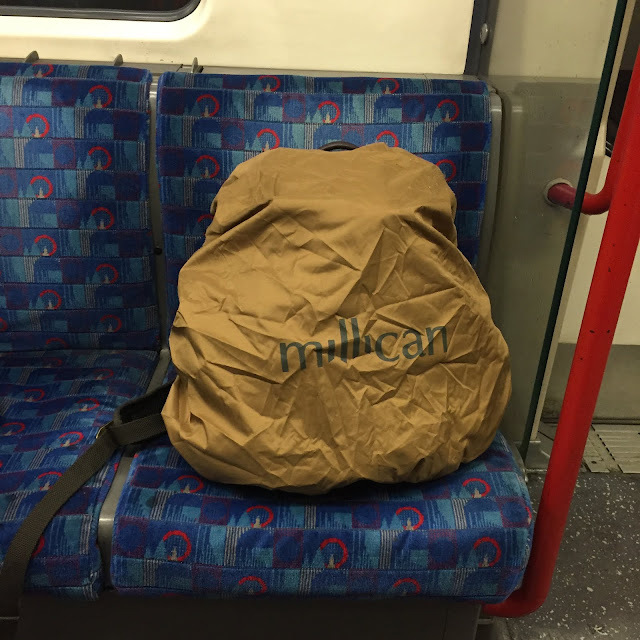 For Christmas my wife and daughter bought me a Millican rucksack called Matthew the Day Pack. Having carefully considered the merits of Smith the Roll Pack and Dave the Rucksack at the Millican website, I think they chose rather well. I've been road-testing it now for six weeks and at last I can say that I have finally found the ideal bag. The straps are good and thick and very well padded. The stud fastenings for the main flap are both secure and easy to use. There are compartments for my notebooks, sketchpads and pencils and holders for both of my flasks – I bring coffee and soup on a two/three tour London Walks day. The contents are easily accessible via a sturdy zip down the front (you don't need a miner's helmet to dig around for that lost pen in this bag). Okay, the stylish element is seriously compromised here, but I ask you this: who looks cool in a cagoule? No one. Not even Derek Zoolander. Even someone as persnickety as I quickly saw the benefits of this ingenious little feature and it's well worth compromising style for practicality for the short duration of a London rainstorm. To deploy the waterproof covering, simply unzip the compartment in the base of the bag, take out the cagoule – it's attached to the bag by a cord – and sheath the bag when the rain gets heavy. Every scrap of clothing about my person was soaked through… but my London Walks leaflets, my sketchpad, my notebook and my paperback book remained as dry as a bone inside my bag. The picture above was taken on the Central Line on my way home from my London Walks tour. This is most appropriate as my wife first spotted Matthew on the tube and approached his owner to enquire about the bag. The chap proceeded to wax lyrical about the virtues of Matthew and he even went into the company's back story, telling my wife that they are based in Cumbria, they are committed to using sustainable materials and even make covers for Moleskine notebooks (another fetish of mine). Thanks Karen & Isobella for my Christmas present. And thanks Matthew for keeping my stuff dry during Storm Imogen. 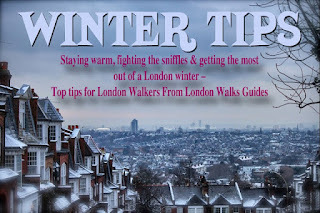 Any tips, London Walkers, for being out-and-about in winter weather? Drop me a line at the usual address.